A most memorable walk travelling back into the past following a dismantled railway to the ruins of workshops where once stones were carved for London Bridge.You can still see some corbels intended for widening the bridge but abandoned for some reason. This walk is more suited for a sunny day as there is nowhere to shelter when it rains. A From the car park take service road and follow this in a southwesterly direction towards the fire station. B Take foot path on left which soon joins the dismantled railway. C In the distance you can see the line meandering to Yelverton. For those who prefer not to 'negotiate' the quarry turn left into a bridle path and descend to rejoin the railway line lower down. When you join ,turn right and continue in a clockwise direction. This may be the safest option if you have young children as the quarry includes steep cliffs and paths are not clearly defined. D Turn left onto a grassy track up the quarry. At the top keep left and descend between the boulders to some ruins. Caution :The quarry has some unexpected steep cliffs. Do not be tempted to follow paths along a cliff as they are quite steep; instead,skirt the quarry slightly lower down. 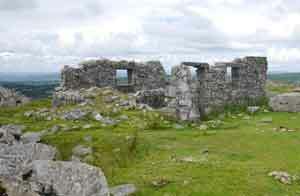 E Remarkable ruins of smithy and engine house with extensive views of Plymouth Sound. F Railway sleepers are still visible .Follow the grassy path outlined by the sleepers until you join the original dismantled railway and continue clockwise. 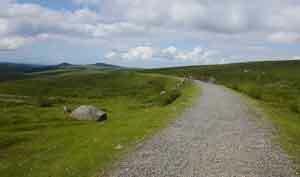 G There is an opportunity to climb a path to King's Tor. Continue along railway line to return home. Although this is an easy walk firm footwear is recommended to cope with fine track ballast. 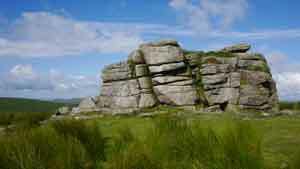 A short walk following Dartmoor Way,bridle paths and lanes. 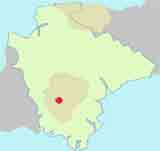 A Start from centre of Princetown and walk along right pavement of main road to Two Bridges. B After an old fountain (dating 1908) take a track right. C At fingerpost turn right. D At next junction turn left ,past Tor Royal,an impressive 18th century building (now a B&B). 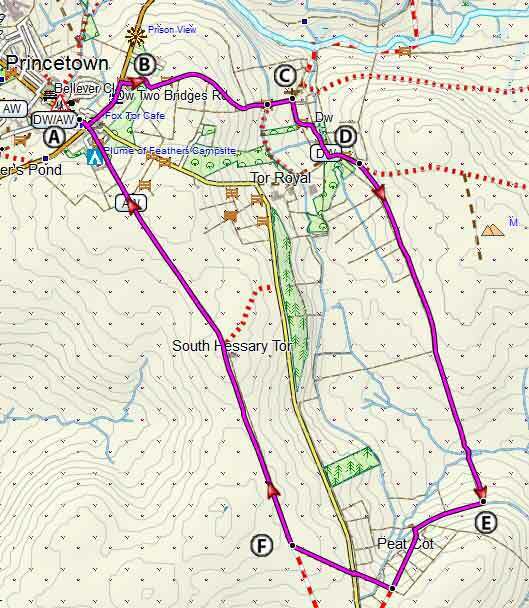 E Turn left for the walk to South Hessary Tor else continue back to Princetown. F Turn right where the fence ends and follow fence uphill . At the top you will see the Tor on yourleft. This bit can be a bit boggy.